One blade might be good, but several blades are better, especially if you are planning on facing down a zombie horde. That is why this Z-Hunter Survival Blade Collection is such a stellar set, because it has all the blades you will need to get by and thrive! This three-piece set includes a trio of bladed weapons that combine the best features of many blades, all into three efficient items. The set includes a full-length machete, a trailsman machete, and a survival knife. 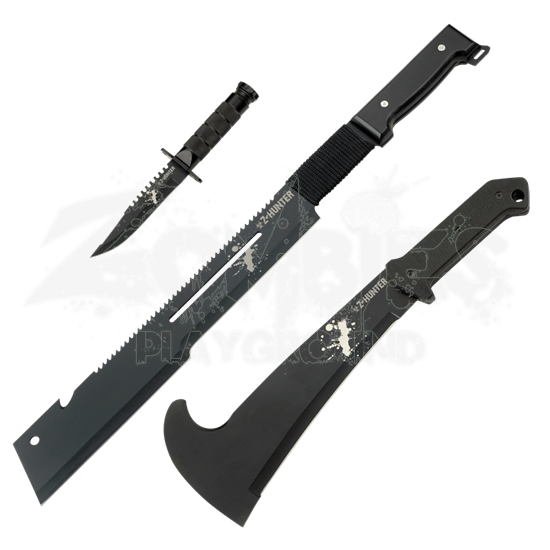 The full-length machete features a blade with no curve, which lends it a measure of chopping power, similar to that of a meat cleaver, while still featuring all the length of a traditional machete (making it ideal as your primary weapon). The serrations on the back and small gut-hook near the tip add utility to this weapon as well. The trailsman machete is shorter and features a broader blade with a wide hook on the back edge, as well as a flat, straight edge that is perfect for carving or chopping (this makes it a great utility item when camping). And finally, the survival knife features broad serrations on the back edge, and a clipped point blade that as effective at slicing and carving as it is at stabbing and piercing, making it a versatile tool that should always be on your belt! Each weapon features a blackened blade of stainless steel, as well as a synthetic handle to provide a secure and solid grip. The set comes with a nylon carrying case that will accommodate all three blades with ease, allowing the set to be stored and carried together. 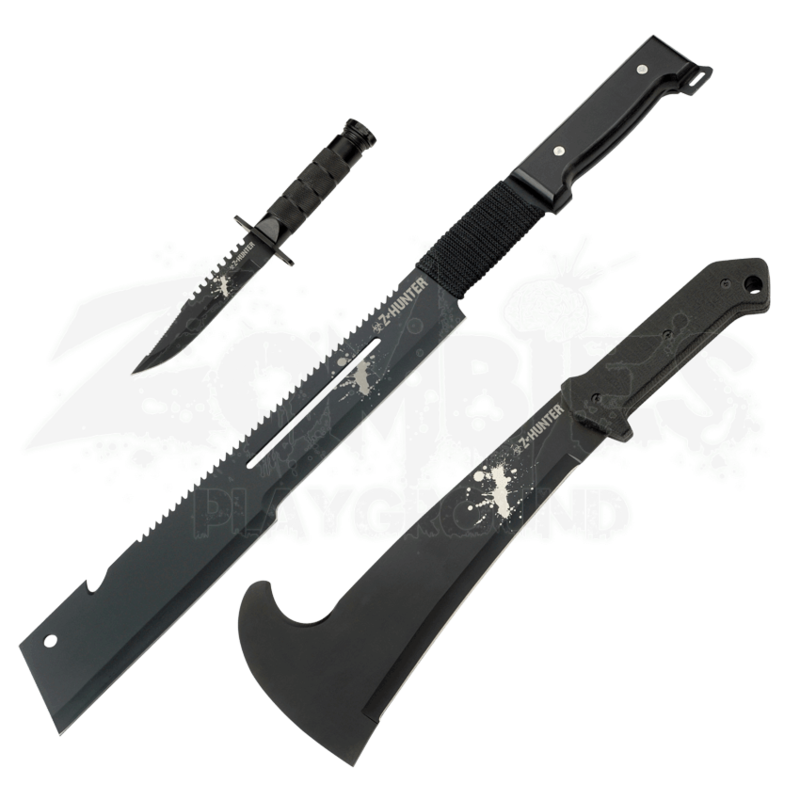 No one weapon will do everything, so your best bet is to carry a few weapons that are good at many things, and this Z-Hunter Survival Blade Collection puts a trio of edged weapons into your hands that are perfect for a variety of survival situations, zombie apocalypse or no.